This is definitely not normal! It does however happen sometimes. Glue fumes entered your eye because either: the under-eye tape was lodged too high or your eyes were not completely shut during the procedure. It usually goes away within a day or 2. It is a glue sensitivity, for which you can ask the expert to use a different glue, for sensitive eyes. I had normal eyelash extensions done from December 2015 till end of March 2016, had no problems at all. Had 3 weeks break and wanted to try the new Russian (Minx) lashes. Gone to different salon 2 days ago on Monday. 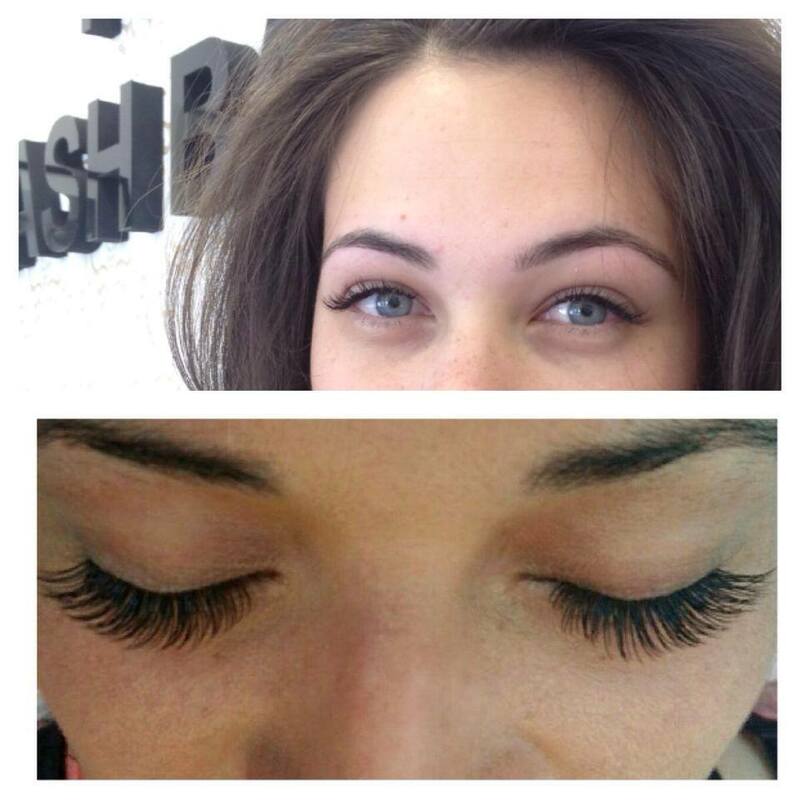 Lashes looked fabulous, I was so happy as we are going on holiday to New York this Friday. It would save me time in the morning. However yesterday afternoon cca 24 hrs after application, my eyelids started to be bit itchy and my eyes bit sore. I wear contact lenses so just got new pair thinking I was due to replace them anyway, but my eyes still felt tired and sore. Washed my eyelids before going to bed and then woke up at night as they felt hot, and itchy. My eyelids were swollen this morning, I have noticed that some lashes are actually glued to my eyelid. Tried to gently pry them of with cloth soaked in clean hot water, but some are still stuck. Even taken antihistamines 2 hrs ago thinking it might be allergy to the glue but don't see any help with swelling. Going back to the beautician after work and see what she says.. I'm hoping it's due to lashes being glued to eyelid, hoping I don't have to remove them 2 days before holiday..
Just to update, my eyelids were getting more swollen next day, so had to have eye lashes removed day before my flight to New York, damn shame.. Not tried them since.. When you get lashes, you should always make sure that you go to a certified and safety-aware lash technician...most of the time it's the application (lashes glued to the skin, lashes glued too close to the lash line, lashes not glued properly at the base, too much glue, lashes used are too heavy, etc. ); sometimes it's the quality of the products - cheap glue with a lot of fumes is a big one...and cheap glues are much more prone to cause an allergic reaction than the higher-quality hypoallergenic ones, which is probably what happened to you at your original lash salon...but regardless, glue should NEVER touch the skin as it can increase the odds of obtaining an allergy - with the exception of those prone to allergies, where patch testing first would be wise); and other times, the person is just allergic, or obtained an allergy from previous applications...upon which, they can't get eyelash extensions or acrylic nails anymore ~ the allergic reaction to the glue just isn't worth it. Only in rare instances, such as yours, should you ask for a patch test BEFORE trying extensions again to make sure that it is the glue that you're allergic to, and not the application process as mentioned above. The technician will dab a bit of their glue on your arm, and wait 24-48h to see if there's a reaction; if there's a reaction, then you really shouldn't be getting eyelash extensions anymore. It's too bad that you didn't get the patch test first, but as your last experience was at a reputable lash salon, it's safe to say that you do currently have an allergy. At least now you know for future reference that you're crazy allergic to the glue. Thank you very much for your kind reply :) My saloon artist told me that if she is applying it after a year it probably gonna be okay and for first hour it was fine. Then it came and it was really painful. After googling a ton about eye irritation after getting lash extensions, I came across the picture of your eyes. Mine look the exact same. I got them on Tuesday evening and they have hurt and been red ever since. The amount of eye drops I am using to help is probably not healthy either. I was thinking it was slight irritation but it is not getting better so I think I need to remove them. Did you go back to the salon or remove them yourself? I have seen both options online. Please let me know! Hi, I visited the beautician the next day, I was communicating with her throughout the whole irritation process and she recommended to get them down as soon as possible, it IT NOT A NORMAL REACTION. I had a lot of reactions before, just mildly irritated, red and itchy, couple of eyedrops made it work, but this was too much. I would definitely recommend going to the salon to have them removed. It is not easy job, had my full set removed and it took almost hour. Can't imagine trying it at home. Hi, I had a similar experience. I had been doing my lashes for about a year with the same beautician at the same place, using the same lash material and glue, then I had my first reaction i.e swollen eyes, this went away on its own after a few days, however when I went in for the fill 2 weeks later the reaction was worse i.e severely swollen eyes, redness, itchy etc.. so I got a cortezone inection from the Dr which provided immediate relief and the swelling went down and I did not have to remove the lashes. I then stopped for 2 years and tried them again and the very first time had the severe reaction and had to get an injection again (the injection provided relief and lashes didn't have to be removed).... not sure why I was ok doing these lashes for a year and then suddenly am now allergic :-(. Hello, I have been getting lash extensions since last May. I've used the same person , same place, same materials. And about 2 weeks ago, my right eye became red and my left eye slightly red. I have no idea what has caused this. I have anti-biotic drops but they don't seem to be helping which makes me think it's an allergy :( I'm very sad, but I don't understand why it would be bothering me now after all this time. I do know that I had some glue stuck to the top of my eyelid and when I tried to get it off, I woke up the next day with a swollen eye lid. But that got better, and then the redness started. I love my lashes.. I don't want to give them up... Is there any hope for me? i had individuals put on around 4 weeks ago, suddenly i got conjunctivitis, i thought it was a coincedence and thought nothing of it as i've had extensions many of times with no problems. So that cleared eventually although my eyes looked a mess! Had my infills last night and woke up today with pink eyes swelling and i couldnt breathe well and my nose is totally blocked with no snot (sorry) i've got a few hives too appeared on me. I dont want to give up my lashes but i've booked in this afternoon to have them off as when i couldnt breathe i thought i needed an ambulance. health comes first! Hey ladies, same over here. I was having lashes for over 2 years same lady, same lashes, same glue. Then I decided to give my lashes a break! Whhhhyyyy did I do this!! Wish I hadn’t. Every time I get lashes now same lady again they swell up, itchy & sore, puffy and red and can’t open them sometimes. But she put this medicine in the form of a gel/cream on my eyelids and lower all over straight after application and it stopped the reaction. Now she puts it on for me each time otherwise I have the same awful reaction. It’s called maxidex 1mg Dexamethasone . In a tube in the form of a cream not a pill. I’m gonna see if I can ask my doctor to prescribe me some as I notice sometimes it still feels a bit sore for a few days & this cream does wonders. Same here! Inhave been having lashes for 6 months and went last time abd had a slight reaction...then webt back for my infill on wednesday and 7 hours later i had a puffy upper lid... 24 hours later bith eyes are swollen and im in a panic. Awake at 3am wondering what the heck i should do??! Git ny doctors on speed dial for the morning. I am so cross with myself for going to get them put back on... i am not that vain but live the lashes look. Wondering what your outcome is/was? I recently got my lashes done (first time in 7 mos), and I woke up with swollen eyes, but the swelling went down in about 4-5 hrs. I did not have any other reactions, no pain, no itc I wanted to see if anyone has experienced this, and if they continued with the extensions or stopped. Hi - I have had the same problem too, but one eye is significantly worse. I had them done yesterday morning at 10am and they were fine but I when I went to bed one of my eyelids was quite itchy in the fold of the eyelid. Woke up in the morning and it was swollen quite badly. Both eyelids are now itchy but the other one doesn’t look irritated. I have taken an oral histamine and have a steroid cream to put on the eyelids. I’ll see if it settles down. Has anyone had success taking an oral histamine prior to their appointment (rather than after)? I want to leave them in for now and wanted try the oral antihistamine on the day of my next appointment, and maybe take for a couple of days post application. 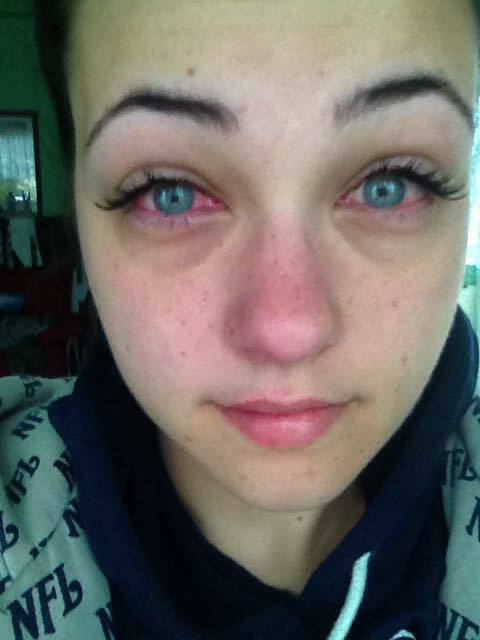 I have taken antihistamine prior to my appointment as I had reaction year earlier and had to remove the lashes. Tried again year later, took antihistamines day before and day off application but it was no help, had same reaction again. Itchy lids, then hot overnight and swollen within 24hrs, had to have them removed again and I'm afraid that is me done with lashes, I just can't have them anymore. I had the same problem. I wore extensions for 4 months with no problem about 3 years ago. I went for my regular fill and my eyes felt itchy and the lid was slightly red and puffy. It went away in 24 hours, so I didn't think much of it. The next time I went for a fill, I had a SEVERE reaction within 24 hours of getting the extensions. Red, swollen, itchy eyes and eyelids. I had them removed, but had to wait until Monday as I got them on a Friday. My eyes were a mess. So no lashes for me for 3 years. Fast forward to now. Three weeks ago I decided to give it a try again with a very reputable tech. The first time I got the extenions, I fell in love all over again with having lashes. My eyes were slightly itchy within 6 hours, but after 48 hours the itchiness disappeared. So I went back yesterday (3 weeks later) for my fill. Within 3 hours they were red and itchy. Within 6 hours my eyelids were red, swollen and sore. Also very itchy. I was also stuffy and sneezing like crazy. I had taken a Benedryl before the fill and after the fill. It did not help. I had them removed this morning. I definitely love the convenience of having lashes and the time it saves, but I clearly cannot have them anymore as I am severely allergic. I did get relief when the eyelashes were removed, but it has been 3 hours since having them removed and they are still very swollen and sore. Not so itchy anymore. I am using cold compresses and staying on the anihistimine until the swelling goes down and i am not so stuffy. Hi, had 3D lash extensions 1 week ago. 5 days into it. Left eye lid started to be painful , and right eye lid very itchy. Decided to remove it myself.... obviously allergy reaction. Thanks for sharing your story! Glad to head you removed them, precautions are important! Mine is the same. Did you remove the lashes? Yes, the very next day and it helped and Im not applying them ever again! I took a break for about a year. Went back this week and they were gorgeous. Woke up the next morning and they were swollen, red and itchy. Made an appointment and had them removed. As I was checking the site I came across an article that read if it happened once, it will happen again. True statement!!!! I am done with the eyelashes. I will keep what God gave me and be content. Ive had lashes on for 2 years then all of the sudden recently got allergic reaction. I think it was the eyelash artist bc I got the reaction after I switched artist. I also had flakey eyelids they were pealing badly. How long did it take for your eyelids to go back to normal?